The gold standard for Blu-ray colour, but is this quickdraw projector late to the party? A modicum of DLP rainbow effect, some so-so black levels and a hint of film judder can't prevent the W2000 from offering one of the loveliest, most involving Blu-ray performances so far from an affordable quickdraw DLP projector. What would persuade you to buy a projector and create your own home cinema? Whereas a big TV is easy to set-up and use – you just take it out of a box and press some buttons – a projector is much more specialised, requiring loads of space, a screen and a lot of cables. At least, that's the fear. Which is why we're now seeing a bevy of so-called lifestyle beamers, like this new BenQ W2000, designed to be plonked on a coffee table and aimed at a wall. What could be easier? However, as well as simple set-up and a short-throw lens, BenQ thinks you want something else, too – HD colour reproduction of the very highest quality. 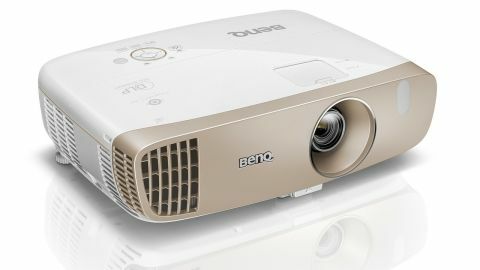 For as well as boasting a new thermal system reduce acoustic noise, the BenQ's new W2000 uses the Rec. 709 standard, an international standard for HDTV colour reproduction. For those of us who love Blu-ray's exactness of detail, the W2000 could be just the ticket. This DLP projector is reasonably short-throw, able to create a 100-inch image from about 2.5 metres away. I found the 1.3x zoom wheel around the lens, and the vertical lens shift dial just above it (both hidden under a sliding door) – of massive help in aligning the image – but I did also have to use the screw-down feet, too (there's one quick release foot on the front, two screw-style feet on the rear). Keystone allows some degree of side-on placement, but not enough and, besides, using it degrades the image's geometry. Set-up on the rear isn't at all tricky, with a couple of HDMIs probably all most users need to know about (also back there is component video, a PC hook-up, an RS-232 port, 12V trigger and a 3.5mm audio jack for taking audio out). All that's missing is a headphones jack. Given the presence of a built-in speaker that would have been nice a nice addition. There's also the fact the USB slot won't playback digital files from a thumb-drive. However, the W2000's remote is perfection; small and easy to operate, it lights-up in orange for use in a blackout. The Rec. 709 standard that makes up the W2000's Cinema preset (the others include Games, Bright, Vivid and two user-defined settings) is truly excellent. With my test disc Gravity playing, the cinematic colours are the W2000's clear highlight, and it's mostly down to the precision-calibration of a six-speed RGB colour wheel. That allows more space between the primary colours while not letting in too much brightness. However the W2000 does grapple with the classic trade-off between brightness and black levels. It's a tricky double-act to pull-off on a projector since black is merely the absence of light, but still the very darkest areas of images do lack both a profound darkness and subtle detail within. Although I would recommend choosing the Normal lamp setting (others include the fainter Economic and the auto-adjust SmartEco), it's a slight issue for the W2000, whose maximum 2000 ANSI Lumens lamp means it can be used in daylight as well as in a blackout. However, do switch the lights out and draw the curtains if you want to benefit from that sumptuous Rec. 709 colours. What the W2000 can't help with, however, is film judder; only the step-up W3000 includes the kind of frame interpolation tech that smoothes-out fast pans and motion. It's also worth mentioning the W2000's built-in speakers, which impress on both volume (at 20W they're just as powerful as your TV) and distortion-free range. Thankfully, such built-in speakers have become a default on all quickdraw projectors in 2015, though on the W2000 it's a little loud even when put on the very lowest setting.